Tesla Motors Inc.’s stock rose 400 percent this year, but Thursday investors and analysts are putting the car in reverse after seeing a video of a Tesla Model S on fire. The Tesla Model S, which achieved the highest safety rating by the National Highway Traffic Safety Administration (NHTSA), crashed on Washington State Route 167 with the front of the car on fire late Tuesday. Shares fell $12.05 or 6.2 percent to $180.95 Wednesday. This is the first negative news after a string of successes for Tesla, says Thilo Koslowski, a vice president and analyst at Gartner. According to a Tesla statement, the car hit a metal object in the road and the driver then pulled over. The driver had enough time to exit, but the damage caused by the collision caused the front of the car to catch on fire. No one was injured. “At this early stage it would be unwise for investors to see this incident as a sign of Tesla’s downfall,” Koslowski wrote. 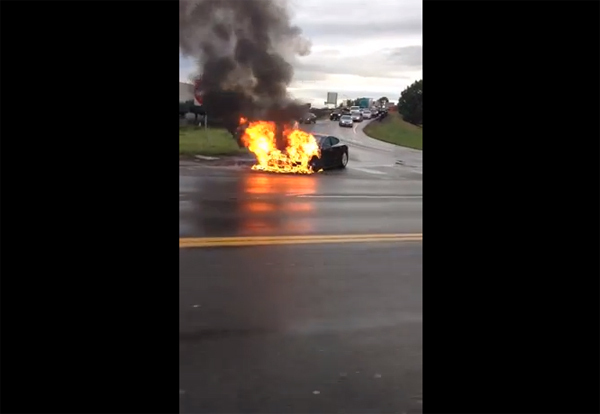 The photos and a video of the burning car were first posted on the car fan site Jalopnik, which states the material came from a reader. The Regional Fire Authority of Kent, Wash., put out the fire with a dry chemical extinguisher, as water “seemed to intensify the fire activity” according to the incident record published by the International Business Times. Because the fire was contained in the front of the vehicle the firefighters couldn’t access it initially. “E71 had to dismantle the front end of the vehicle to gain access to the burning material,” the fire authority reported. They then found it was the battery pack, which was on fire. Model S is fully electric, and the lithium-ion battery pack sits at the floor of the front of the vehicle. The battery pack has 16 modules, and each is designed to by isolated by fire barriers to limit potential damage, according to a Tesla spokesperson. Lithium-ion battery fires have been an area of concern. Earlier this year Boeing Co.’s 787 Dreamliner planes were grounded for months because of fire hazards. In two separate incidents lithium-ion backup battery packs caught fire. In April, the Federal Aviation Administration approved the improvements Boeing made on the battery system. In 2011 the NHTSA crash tested the Chevrolet Volt and reported the possibility of batteries overheating and catching fire. About 8,000 Volts were on the road at the time and General Motors Company voluntarily announced it would make changes to the battery surroundings. No electric vehicle fires had occurred at the time of the announcement in real-world scenarios. “Based on the available data, NHTSA does not believe that Chevy Volts or other electric vehicles pose a greater risk of fire than gasoline-powered vehicles,” NHTSA stated. The NHTSA monitors lithium-ion battery fires and under normal circumstances would investigate the Tesla crash near Seattle, but due to the partial government shutdown, investigations have been suspended, according to Fox News.